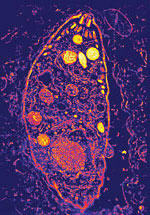 Half of the world's human population is infected with Toxoplasma. Parasites in the body - and the brain. Remember that. Toxoplasma gondii is a common parasite found in the gut of cats; it sheds eggs that are picked up by rats and other animals that are eaten by cats. Toxoplasma forms cysts in the bodies of the intermediate rat hosts, including the brain. Since cats don't want to eat dead, decaying prey, Toxoplasma takes the evolutionarily sound course of being a "good" parasite, leaving the rats perfectly healthy. Or are they? Oxford scientists discovered that the minds of the infected rats have been subtly altered. In a series of experiments, they demonstrated that healthy rats will prudently avoid areas that have been doused with cat urine. In fact, when scientists test anti-anxiety drugs on rats, they use a whiff of cat urine to induce neurochemical panic. However, it turns out that Toxoplasma-ridden rats show no such reaction. In fact, some of the infected rats actually seek out the cat urine-marked areas again and again. The parasite alters the mind (and thus the behavior) of the rat for its own benefit. Toxoplasma infection is associated with damage to astrocytes, glial cells which surround and support neurons. Schizophrenia is also associated with damage to astrocytes. Pregnant women with high levels of antibodies to Toxoplasma are more likely to give birth to children who will develop schizophrenia. Human cells raised in petri dishes, and infected with Toxoplasma, will respond to drugs like haloperidol; the growth of the parasite stops. Haloperidol is an antipsychotic, used to treat schizophrenia. Dr. Torrey got together with the Oxford scientists, to see if anything could be done about those parasite-controlled rats who were driven to hang around cat urine-soaked corners (waiting for cats). According to a recent press release, it turns out that haloperidol restores the rat's healthy fear of cat urine. In fact, antipsychotic drugs were as effective as pyrimethamine, a drug that specifically eliminates Toxoplasma. Are parasites like Toxoplasma subtly altering human behavior? As it turns out, science fiction writers have been thinking about whether or not parasites could alter a human being's behavior, or even take control of a person. In his 1951 novel The Puppet Masters, Robert Heinlein wrote about alien parasites the size of dinner plates that took control of the minds of their hosts, flooding their brains with neurochemicals. In this excerpt, a volunteer strapped to a chair allows a parasite to be introduced; the parasite rides him, taking over his mind. Under these conditions, it is possible to interview the parasite; however, it refuses to answer until zapped with a cattle prod. He reached past my shoulders with a rod. I felt a shocking, unbearable pain. The room blacked out as if a switch had been thrown.. I was split apart by it; for the moment I was masterless. "The joy," I repeated, "-the joy of . . .nirvana." That was it; the word fitted. I felt like a dog being patted for fetching a stick; I wriggled with pleasure. The lancet fluke Dicrocoelium dendriticum forces its ant host to attach to the tips of grass blades, the easier to be eaten. The fluke needs to get into the gut of a grazing animal to complete its life cycle. The fluke Euhaplorchis californiensis causes fish to shimmy and jump so wading birds will grab them and eat them, for the same reason. Hairworms, which live inside grasshoppers, sabotage the grasshopper's central nervous system, forcing them to jump into pools of water, drowning themselves. Hairworms then swim away from their hapless hosts to continue their life cycle. Not all science-fictional parasites are harmful; read about the Crosswell tapeworm from Brian Aldiss' 1969 story Super-Toys Last All Summer Long, which keeps people who overeat from becoming obese. Not to mention robots based on parasites. Read press release on evidence for link between Toxoplasma and schizophrenia, Suicidal grasshoppers. Story via blogger Carl Zimmer and his readers.